If you’ve recently separated from the military and are seeking a civilian job, your first step should be preparing your resumé. But if your military experience doesn’t translate directly to a civilian role, it can be challenging to identify transferable military skills to list on your resumé. Tommy Furlong, academic and career advisor for veterans and servicemembers at Northeastern University, shares his advice on how to get started. He suggests that, when writing a resumé, military students examine the requirements for roles they’re interested in alongside the skills they acquired during service—looking to highlight any connections between the two. Then, make sure to list these overlapping skills on a resumé that’s specifically tailored to an individual job posting. For example, if you are applying for a system administrator position, you will want to emphasize the technical skills, problem-solving skills, and possibly even the security clearances you gained in the military—showing the hiring manager how your work in the service can apply to the open role at hand. Below, Furlong shares ten common transferable military skills to include on your civilian resumé. Whether you climbed the ranks or were in charge of a small squadron, the military left you with leadership skills which are highly desired in many civilian roles. From education to business, every field benefits from a leader who is confident, leads by example, and motivates their team to bring a job to completion. For students looking to break into finance or other business roles, Furlong recommends highlighting not only the leadership positions that they’ve held but “the financial responsibilities that they were in charge of within those leadership positions.” As a squad leader, for example, you might have had 12 individuals underneath you and hundreds of thousands of dollars of government resources that you were responsible for, he says. Don’t let these major accomplishments go unnoticed. When crafting your resumé, make sure to list any skills you’ve developed related to budgeting, financial management, and resource allocation, as these are in-demand skills for many employers. The military teaches the importance of taking responsibility for your actions and seeing tasks through to completion—a coveted quality in the professional world. After all, in business, time is money. Employers don’t want to have to babysit or hold each employee’s hand through each task. Instead, they want self-starters who know how to tackle a project with little direction. They want individuals who can set goals and accomplish them ahead of time. Most workplaces are a melting pot of personalities, which can often lead to drama or unproductive workflows. Fortunately, military life trains individuals to communicate respectfully and effectively to all individuals, including high ranking officials and civilians with diverse backgrounds. The communication skills you’ve gained in the service will benefit you in any position and help you advance in leadership roles. You will be able to communicate effectively to your team in a way that helps everyone work to the best of their abilities—a skill you should be sure to highlight in your resumé and during your interview. After separating from the military, many employers will perceive an air of honor to you, which will likely work to your advantage. Sixty-five percent of employers say they would be more likely to hire a veteran over another equally qualified candidate due to a veteran’s perceived integrity. Recruiting and onboarding talent takes considerable effort for businesses, so it makes sense that they would rather spend their time, energy, and money hiring someone they already believe to be trustworthy and dependable. Veterans with technology, software, and analytics skills are in high demand, and it’s no surprise why. U.S. News reports that “software developer” is the top career for 2019, with 30 percent job growth expected by 2026. This is good news for vets, who are five to six times more likely than nonveterans to list certain technical skills, such as technical writing and software code debugging on their resumés. Don’t forget to include your knowledge of any programming languages or software tools to increase your marketability. While many qualified individuals enter the workforce each year, there is a difference between solo talent and team talent. Some individuals, while bright, cannot thrive in a team setting which is detrimental for a company’s workflow. Your time in the military has likely forced you to learn how to work with and succeed with all types of personalities. You know when to lead and when to follow and support. This is a critical skill that keeps businesses running smoothly. A tight deadline won’t make you break a sweat after your military experience which gives you a great advantage in the workplace. You’ll stand out from the competition in times of crisis, able to present your best work despite added stress. The ability to lead a team successfully in pressure-filled situations is equally important and a good transferable skill to add to your resumé. Due to rapid technological advancement and an increasingly competitive global market, companies must be ready to change course and shift priorities at a moment’s notice to stay relevant. Thankfully, your time in the military has taught you to do the same. You’re ready to adapt to new situations and surroundings with little preparation. This is a critical skill in careers that require you to stay consistently ahead of the trend, such as cybersecurity and supply chain management, among others. Not every mission goes as planned in the military, so you’ve likely learned to think on your feet and quickly identify solutions as problems present themselves. This same intuitive thinking is highly valued in business, as a simple mistake can cost a company thousands, if not millions of dollars. Employers are looking for professionals who can identify problems before they occur and find creative ways to solve problems to save time, resources, and money. Stand out to hiring managers by including examples of your successful problem-solving during your time in the service. Now that you know which transferable skills you should list on your resumé, how can you take the first steps toward a civilian career? Furlong recommends starting with a solid plan and a few opportunities in mind. Furlong mentions that veterans can use their generous education benefits to explore new disciplines and industries that they are interested in without paying out-of-pocket, to help ease the transition and alleviate any financial burden. Your time in the service shaped who you are, but it not the only thing that defines you. You have the power to create whatever future plans you desire, and it all starts with a degree program that stands proud behind its military students. Northeastern University is a firm supporter of its military student population, boasting an 83 percent graduation rate among military students, which is 32 percent higher than the national average. Even more promising for those transitioning from military to civilian careers is that 90 percent of Northeastern’s military grads are employed or are in graduate school nine months after graduation—made possible by the $2 million that is invested in Northeastern’s Yellow Ribbon program to help veterans earn a degree. Are you ready to make your degree after military service a reality? 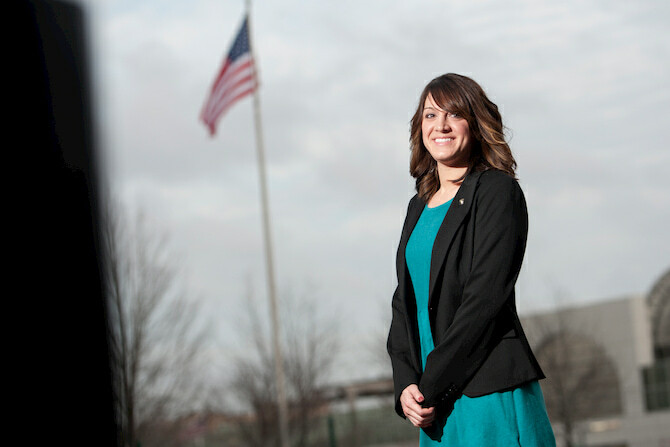 Explore our programs to find out which degree is right for you, or connect with our military admissions team to learn more.